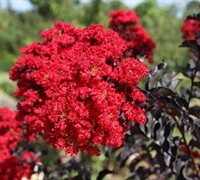 'Catawba' is a Fauriei Hybrid crape myrtle that produces an abundance of large, long-lasting, purple colored flower clusters. It is one of the best purple flowering trees available. It is one of the mid-size crape myrtle trees with excellent form and shape; topping out at 10-12 feet in height with a rounded dome canopy to 10 feet in width. 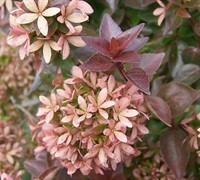 The green foliage has a bronzy cast in spring, bright green leaves in summer, turning orange-red in fall. A mid size crape myrtle , Catawba is great for use in small groupings or as a single specimen, as a colorful screen or hedge, on the corners to frame in homes and other structures, or planted on both sides of an entryway. 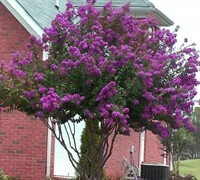 Beautiful Crape Myrtle. It arrived in great shape even though the box was a bit dented but i think that was a Fedex issue. Plants are healthy and looking great where planted! Will order again!